Location: North 61:14.948, East 006:25.369 (GPS at the summit). 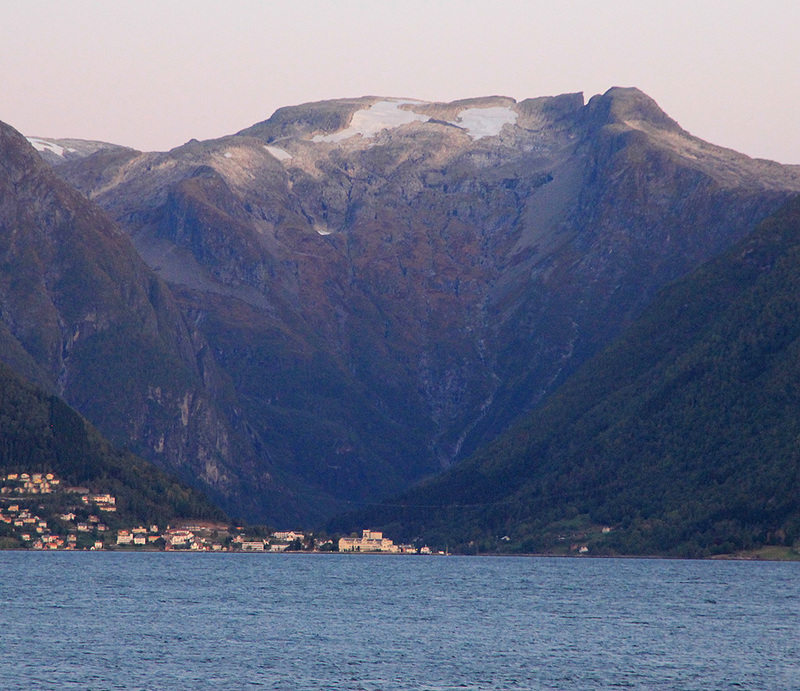 How to get there: This mountain is near Balestrand. From Bergen, the easiest route is to take Hwy. E-16 to Voss and continue to Vinje where Hwy. 13 forks left. Continue on Hwy. 13 across Vikafjellet to Vik and Vangsnes where the ferry leaves for Hella and Dragsvik. 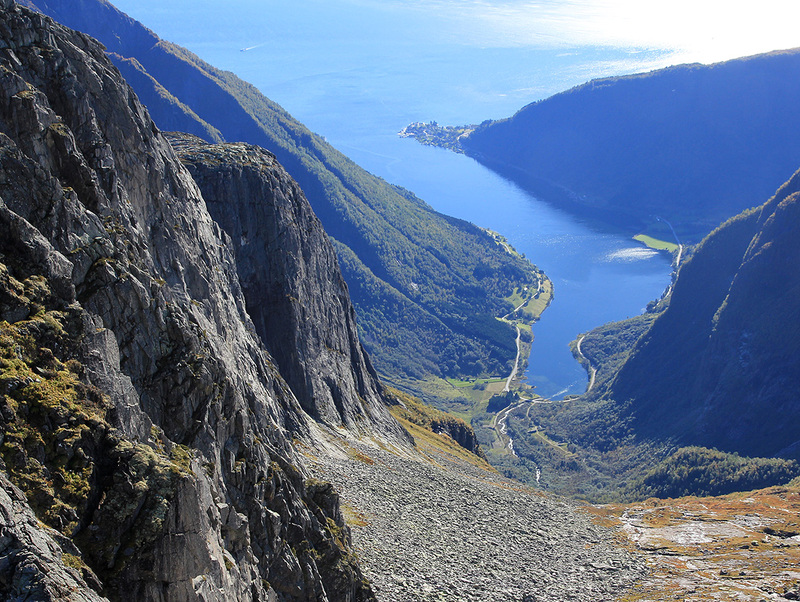 The drive from Bergen to Vangsnes is about 2.5 hours. You need to go to Dragsvik, the ferry will make a stop in Hella and you may have to change ferry here. The ticket was NOK 105 for two adults (2010). From Dragsvik, drive up to the traffic circle and turn left (towards Balestrand). 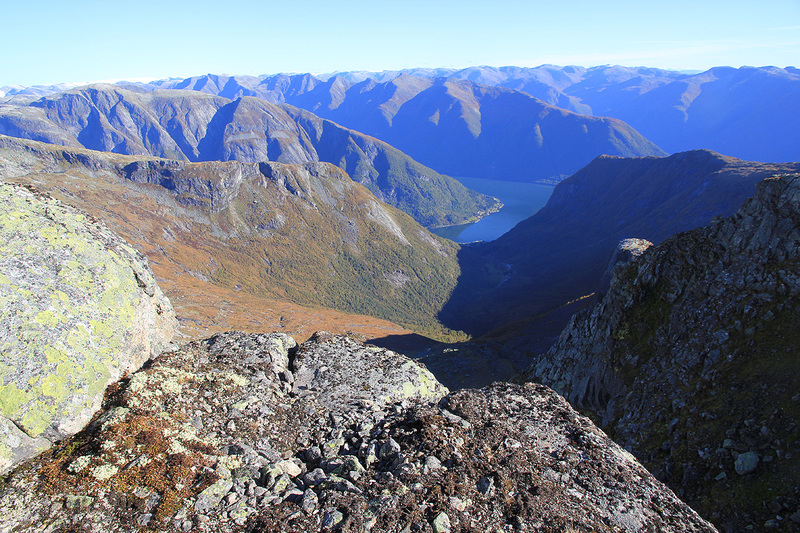 Continue about 4 kilometer to Esebotn, the innermost part of the Esefjorden. About 50 meter after the Esebotn Camping (sign on your right), there is a small turnout on the right where one can park. This is the trailhead, location N61:13.750, E006:29.017, elevation about 2 meter. Route description: From the trailhead, go through the gate and follow the trail along the edge of the field. At the end, the trail zig-zags up the first slope, it may be marked by red tape. After more gentle terrain you emerge on an open area with traces from a (mostly) dry creek. Cross and proceed to the upper left area where you again pick up the trail as it goes in between trees. The trail is now easy to follow and marked with red tape. 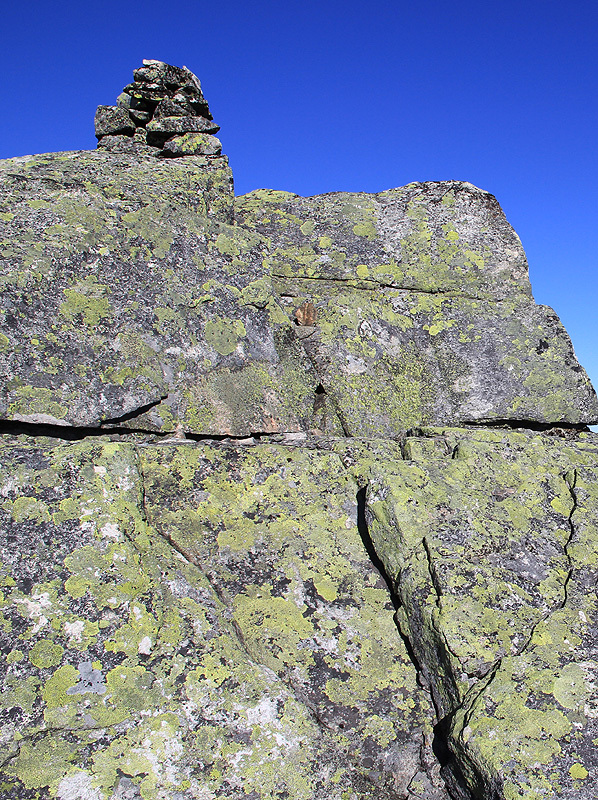 It climbs steeply, partly zig-zags up what is the lower east ridge from Gulleplet, the rock ridge higer up. Higher, this trail emerges on some more open patches of grass. 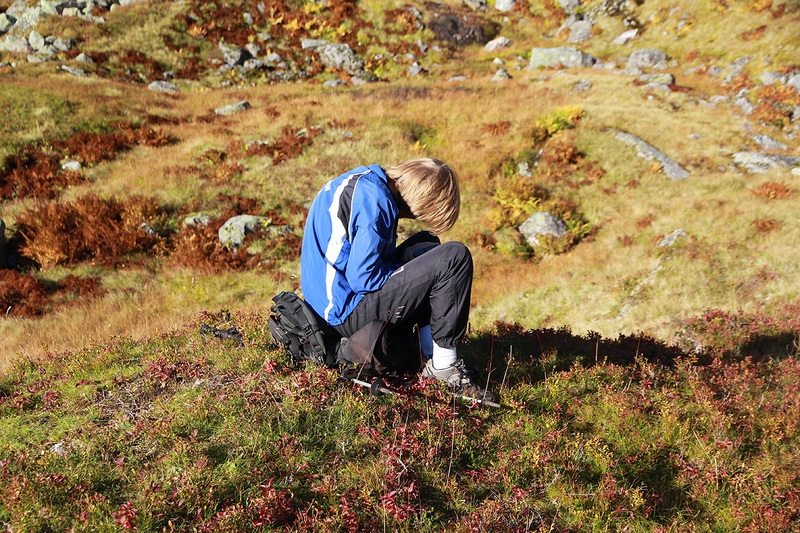 Continue uphill, then traverse right and descend slightly in order to gain the broad gentle slopes that continues uphill. The trail disappears in this area, but the terrain is very nice as you continue ascending. We passed a small local hill-point at location N61:14.359, E006:26.728, elevation 918 meter, one can also stay further left (south). 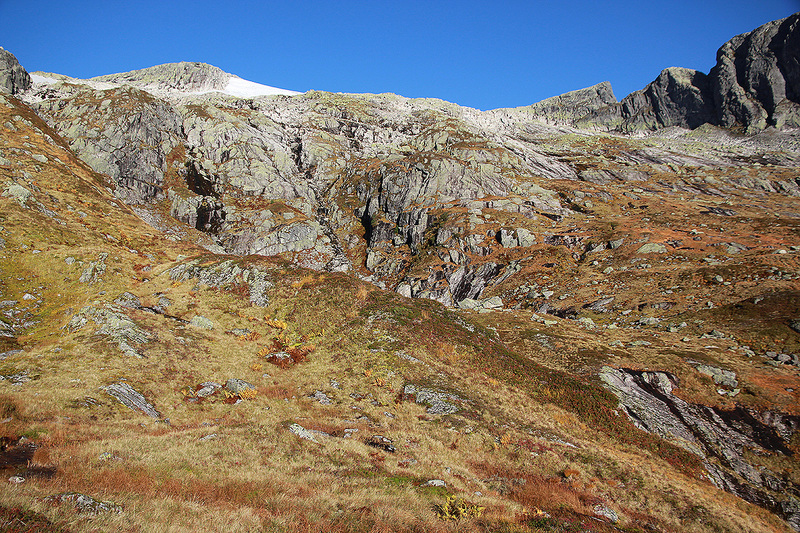 A very clear gully separates the Gulleplet ridge (on your left) from the general slope going north-east. Head left (if coming from point 918), ascending into this gully. Follow it uphill, then continue along a very natural line in the same direction until you gain the easy ridge that will take you to the local top marked as 1251m, on the map. Proceed north, descend slightly to the local col (separating 1251 from the slope going higher), then ascend more steeply following the broad ramp that runs up and left (west). This path provides easy access to the top plateau. 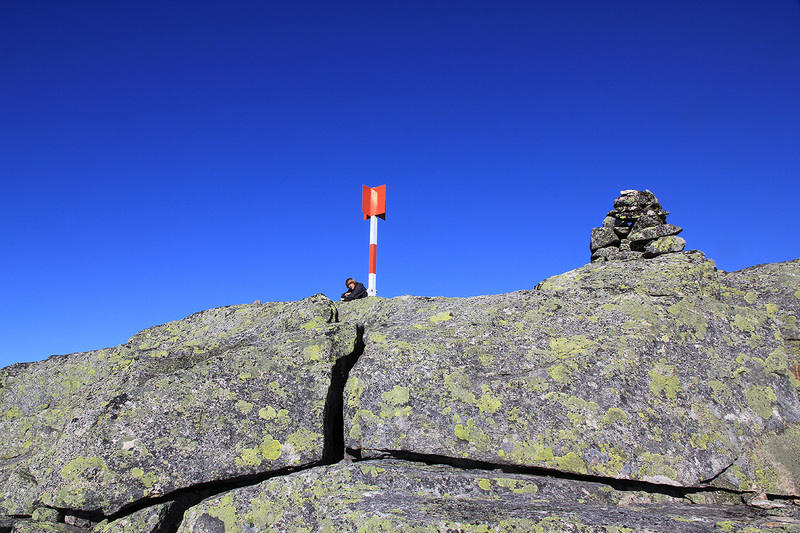 Continue north across broken rocks in order to gain the highest point marked as 1464 meter on the map. 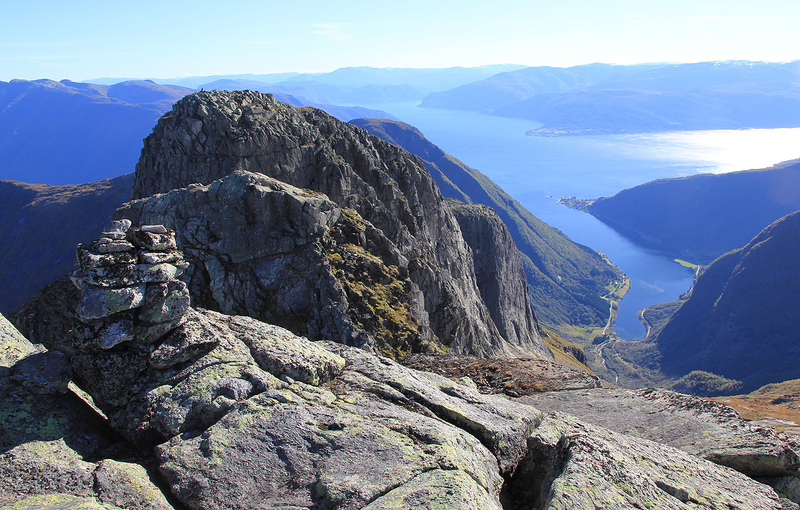 Note: This climb is described in the book "OPPTUR" by Anne Rudsengen. If you have an edition before 2011, ignore the description (the route called 08-04 Keipen). That route is very cumbersome and the description is highly inaccurate. Do follow the route outlined above. Future editions are likely to be consistent with this. 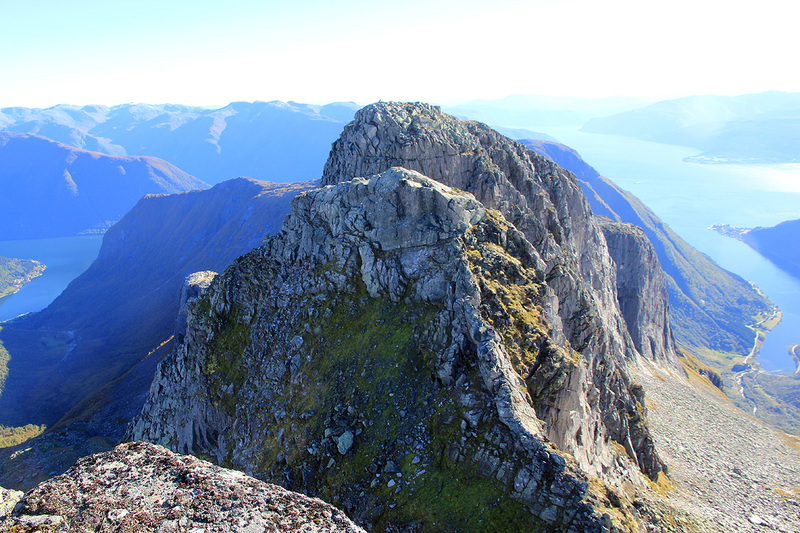 Comments: Bjørnabreen had long been on my to do list, being one of the last unclimbed mountains with more than 600 meter of prominence within reach as a single day trip from Bergen. The terrain does not look good for skiing (avalanche danger), thus a summer trip was called for. The forecast for Sunday promised sunshine and Pål Jørgen wanted to come along. We started from Bergen at 0500 and had ample time to catch the 0735 ferry from Vangsnes. 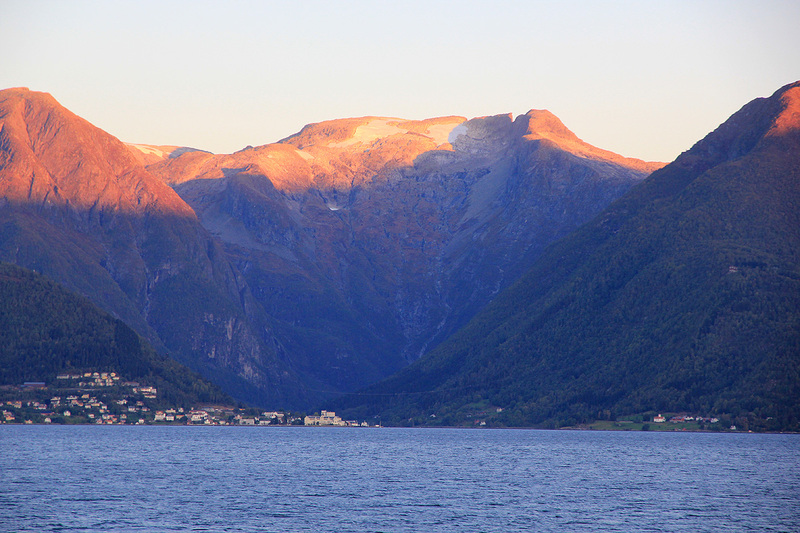 The sun was just about to hit our hiking goal, being very visible from the ferry. We parked at the trailhead around 0815 and were ready to go by 0830. The trail was easy to follow, marked with red markers. Higher up, we did notice a smaller trail forking left while the main (and marked) trail climbed right. Following the main trail, I realized that we deviated from the trip as described in the book OPPTUR. Too bad, as this description called for walking on an old road/path that had been man-made more than hundred years ago. 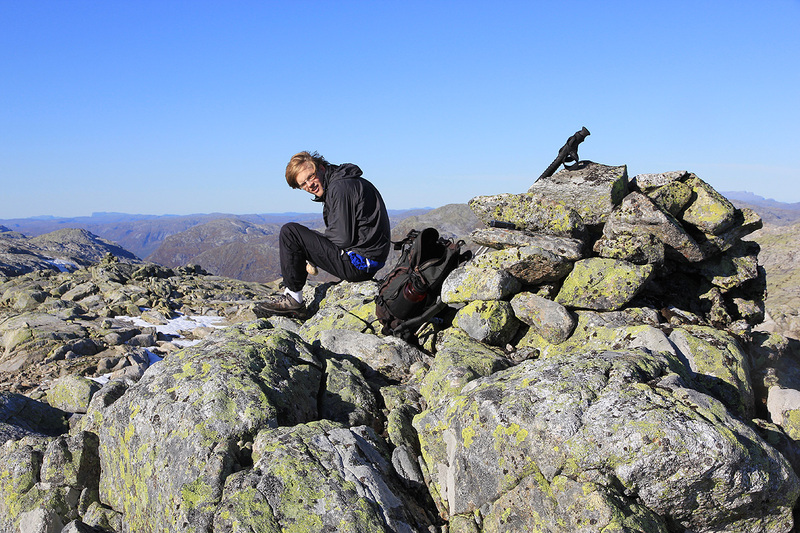 We made good progress and allowing for a short break at point 918, proceeded to the summit arriving there shortly after 1100, 2.5 hours or roughly 600 vertical meter per hour - a very acceptable pace. 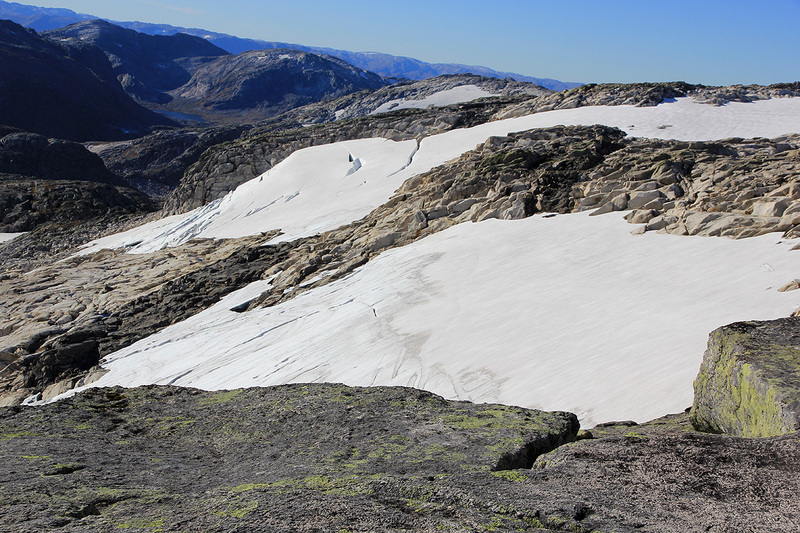 A great panorama view, not only to parts of Jostedalsbreen glacier, but also prominent summits in Jotunheimen could be seen. We rested about 15 minutes, then headed over to the perhaps better known cliff called Keipen. 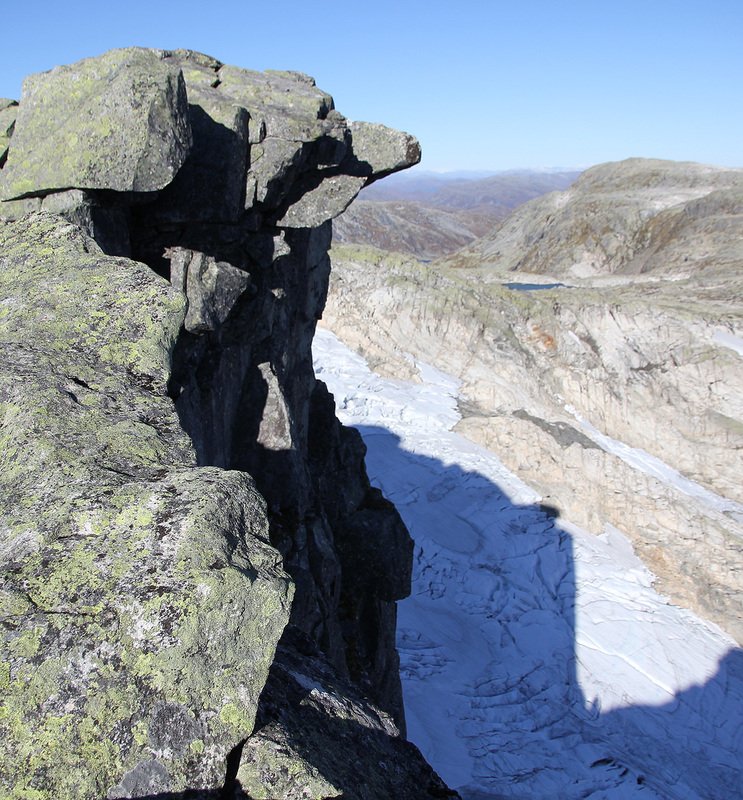 At 1426 meter, but with almost no prominence, this cliff has overhanging parts and provides perhaps a bit more of a dramatic view down to the main Bjørnabreen glacier on the north side and to the trailhead at Esebotn more south. We were there by 1130 and enjoyed the great views. The sun was warm and we had lunch. One can sneak all the way out on the cliff and take a picture straight down. The ridge continues further east, but the big cut between Keipen and the next summit makes this traverse a rather complex project. Leaving at 1200, we figured that it would be nice to explore the "official route" as described in the book OPPTUR. Walking downhill on what had been a man-made path/road would be nice and comfortable. 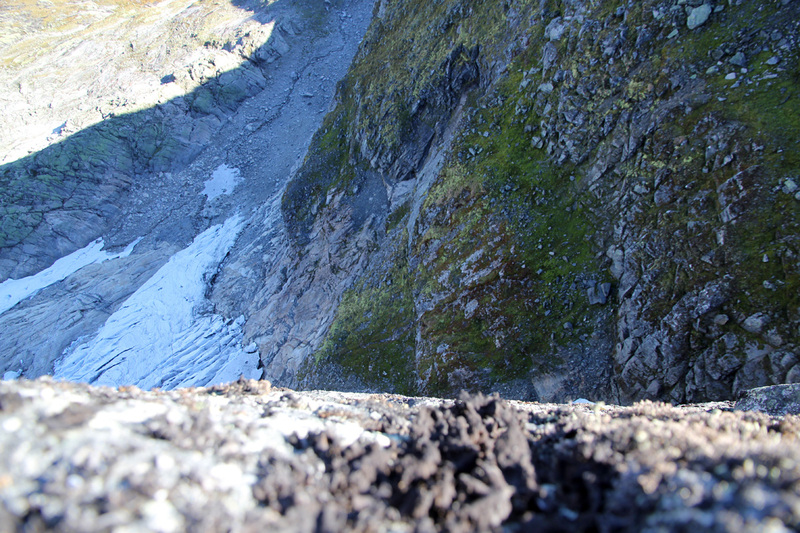 But first, we scrambled down from Keipen to point 1251, taking a route between the two parts of the glacier. 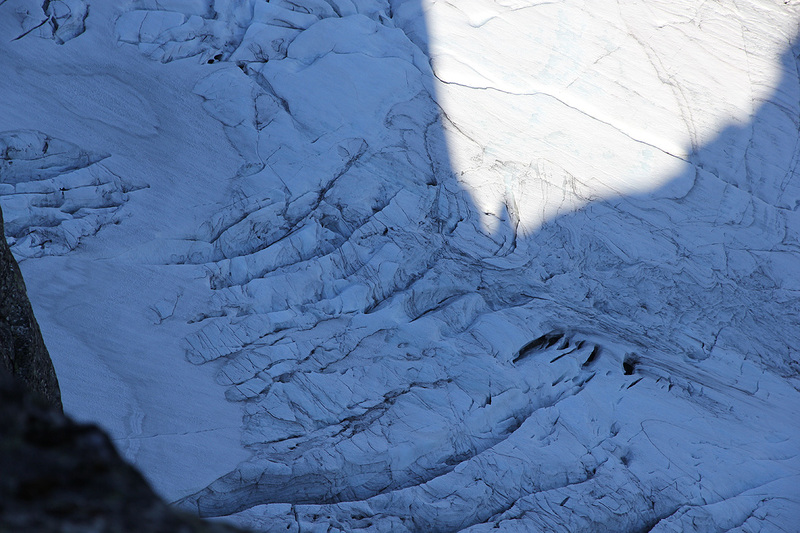 This used to be a single glacier, but now it looks like it may quickly melt away. The rock is smooth and polished, clear signs that the ice used to cover this area until very recently. 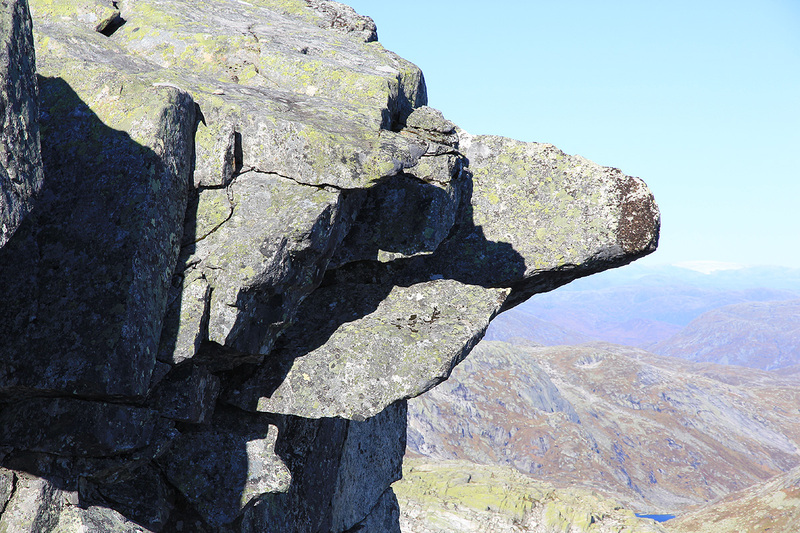 This route requires some scrambling, (YDS) class 3. Thus, we headed down to lake Gulleplet, elevation 952. 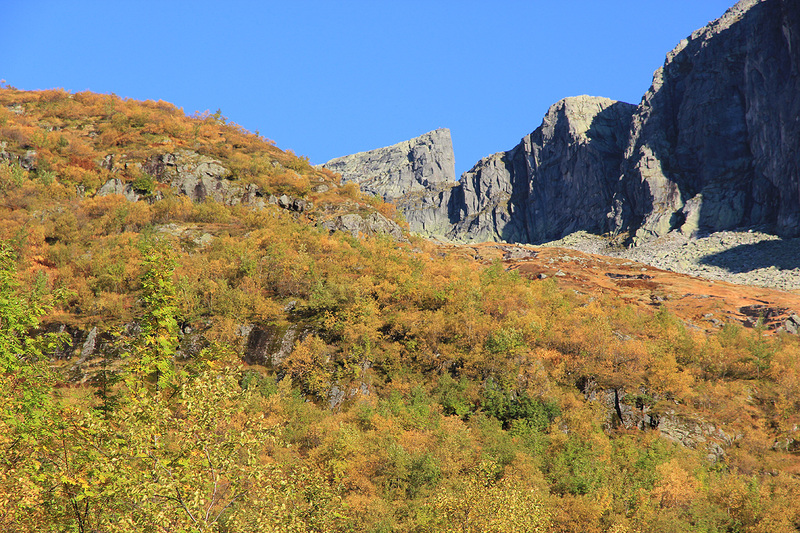 From here, we climbed the ridge (as described) to the local top (1030), then looked carefully for a trail. The terrain was steep and ugly. With no luck, we climbed back up and descended to the col just south of the lake and continued searching for a way down. 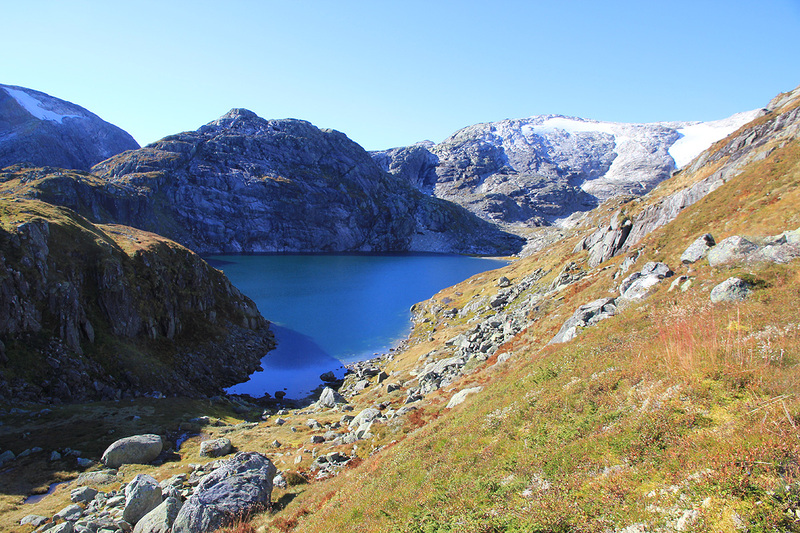 This search eventually brought us all the way across to lake Skardavatnet, 997 meter. 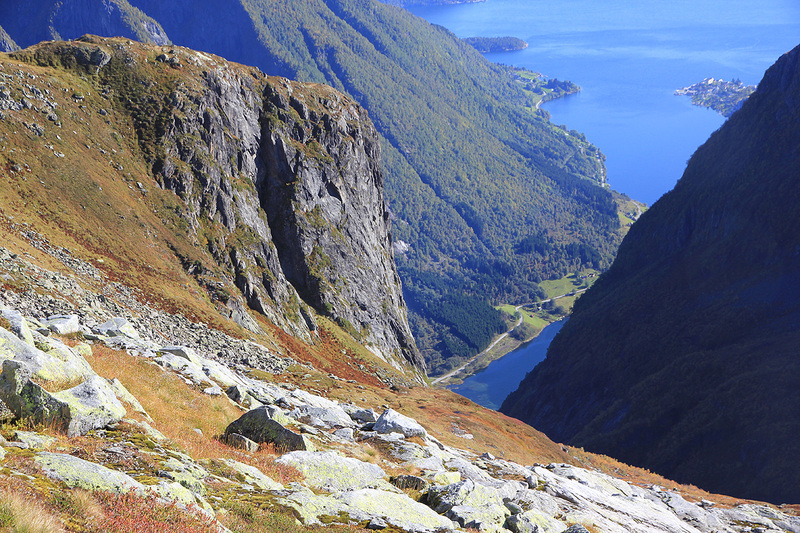 At this point, we were running short on time (had agreed to be back in Bergen for dinner at 1900), thus descending down the narrow gully towards Yglebotn seemed the only option. 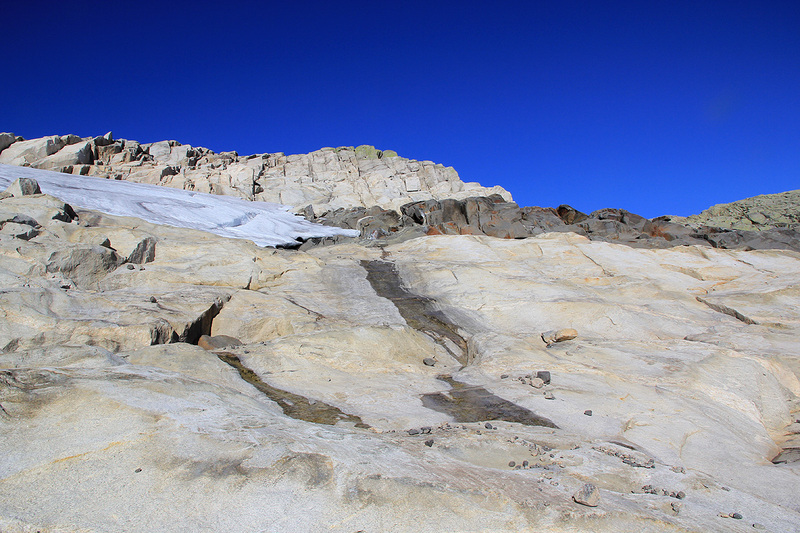 We arrived at the big mini-glacier there, elevation approximately 800 meter. 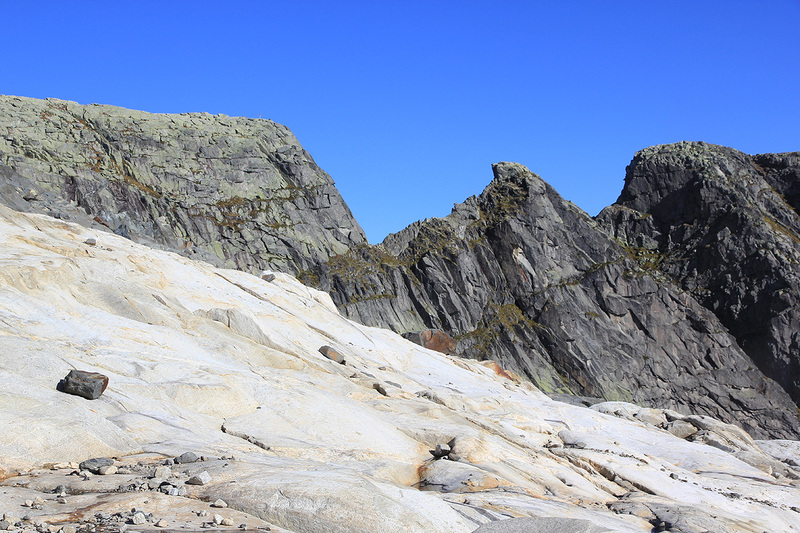 Ugly terrain with huge, slippery boulders. Pål Jørgen had only jogging shoes and this ice was slippery. 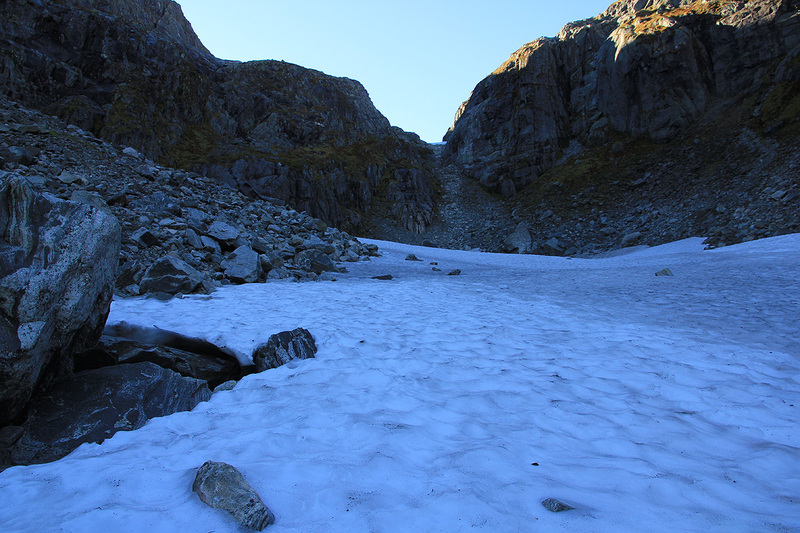 I put on crampons, then held on to Pål with a long sling as we carefully descended the sloping ice. Further down, the valley continued with dense ferns growing on and among boulders. No sign of any trail, not to mention a path/road! We struggled down along the river and eventually picked up a very faint, overgrown trail on its left side. This trail did not seem to have been used for quite some time and it was very marginal indeed. Eventually, it did connect back to the spot where I had noticed a fork when going uphill. We hurried down as fast as we could, and made the car by 1620, 4:20 down (rushing) should be compared with 2:30 up.. When we subsequently had to wait until 1700 for the ferry, I called home and succeeded to postpone dinner until 2000. We had a nice drive home, with substantially more traffic, then a very nice dinner concluding what had been a great September day in the mountains. 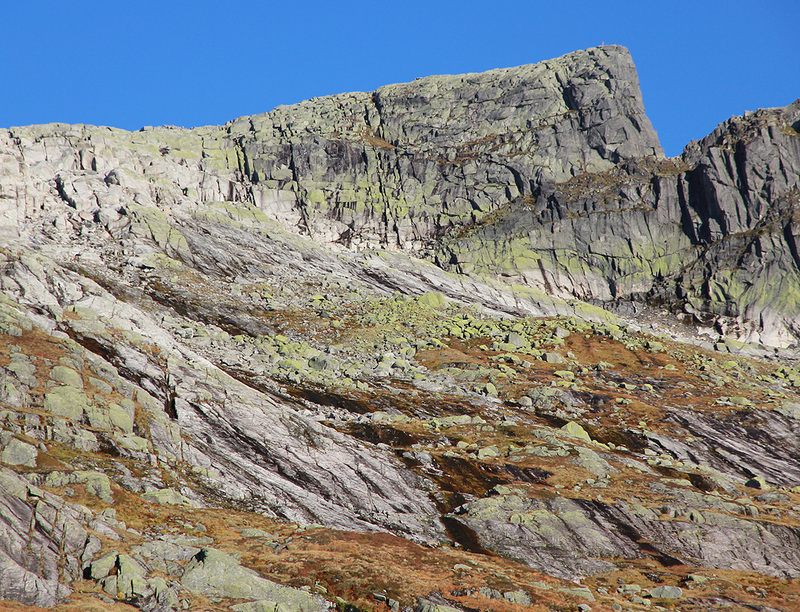 Bjørnabeen mountain, Keipen is the steep cliff towards the right. 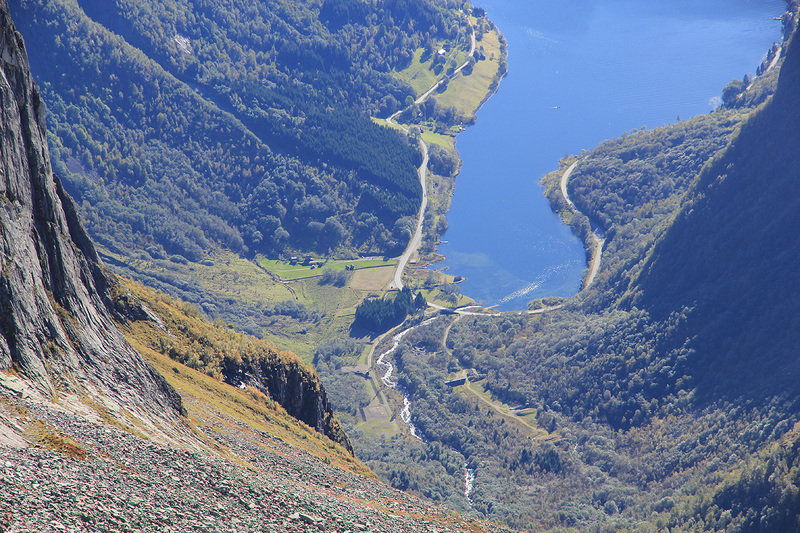 Esebotn, my car is parked near the road curve. Photo from Keipen. Keipen, as seen from about 920 meter while ascending. Meneseggi, a great traverse that I skied in 2004.